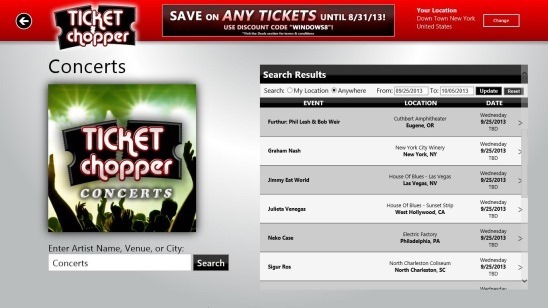 Ticket Chopper is a free Windows 8 ticket finder app that lets you find and buy tickets for events happening around you, or anywhere else. 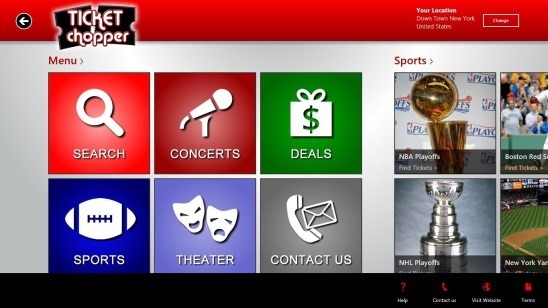 You can find tickets for any sporting event, concert, or theater. The app lists the tickets provided by different ticket sellers, lets you compare them for prices and seat locations, and finally find the best deals on tickets. Also in a way, this free Windows 8 ticket finder app helps you to follow a particular team or music band. You can easily view their tour schedule, and the places where they’ll be performing or playing, so that you won’t miss any single event of your favorite star. If you are a big time fan of a sports team or music band, then this is a must have Windows 8 app for you. You can get Ticket Chopper under the Shopping Category in Windows Store. Or press Win + Q combo and make a search using app’s name. Ticket Chopper, as everyone knows, is a quite famous website for finding the best deals on tickets for the upcoming sporting events, music concerts, and theaters. This Windows 8 ticket finder app is the official client app of the website. The app gives the 100% money back guaranty, but under the same terms and conditions which are mentioned on the official website. You can check out the website here. With the help of this Windows 8 ticket finder app, not only you can easily search and discover the upcoming shows and events near you, but also buy tickets for them from within the app. Plus the app also gives a good amount of details about the event and the seats, such as the date and venue of the event, some special comments on the seats (like “Open air seating”, “first/second row in a particular section”, “the time when the tickets will be ready for delivery” etc. ), which section, which row, number of available seats, and many more. Besides that, one good feature of the app is: it comes with good quality seating charts. You can easily view the particular area where you’ll be seating. Hence, helps in deciding whether to spend your money on that seat or finding some other seat. The app’s interface is good, switching between different screen and scrolling down the tickets list is smooth and easy. The app updates on regular basis, and hence provides latest deals on tickets. This ticket finder app gives you option to browse for events and tickets by Categories at the Main Screen or make a manual search by using the inbuilt Search within the app. The three categories that you’ll find in the Main Screen are: Sports, Concerts, and Events. 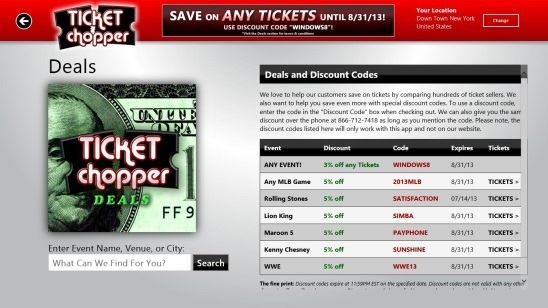 Ticket Chopper Windows 8 app also helps you to save more on a particular deal by providing you Ticket Finder promo codes (discount codes) right in the app. But it is important to note that these codes are available for some particular events only and works only in the app but not on the website. Also check out this free NASCAR App for Windows 8, which shows latest news and videos from the world of NASCAR. Good and handy Windows 8 ticket finder app. Finds upcoming events related to sports, concerts, and theaters. If you dig more then you can find events by music genre, sports type, and more. Helps you save more by giving out discount codes. Helps in finding out the best VIP deals. 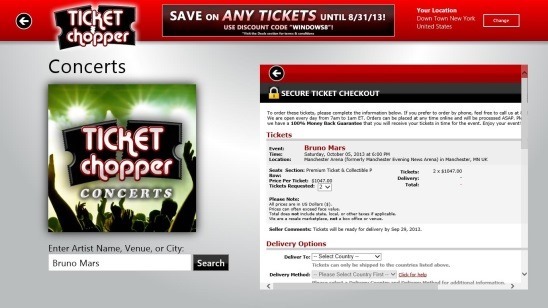 Ticket Chopper is probably one of the best Windows 8 ticket finder app out there. Working with the app is no rocket science. It updates on regular basis, plus the other features provided in the app makes it a good option for finding and buying tickets. 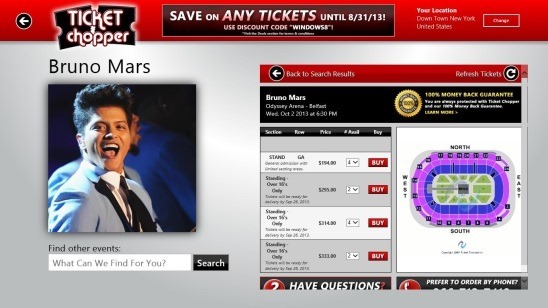 You’ll get the option to choose from hundreds of tickets in the list. It serves what it promises. Get this free app and grab the best deals on tickets before they slip out. You might also like this free Windows 8 Movie Theaters App, which shows the movie running in theaters nearby.